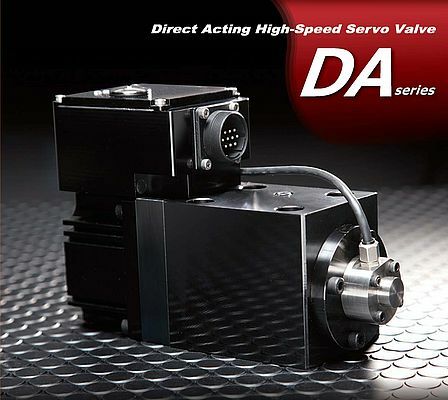 Santest offers the new DA Series of "High Speed Servo Valves" for hydraulic and pneumatic applications, employing "Dual Halbach Magnet Array" which reinforces magnetic tandem. As a result, the higher response and surpassing anti-contamination characteristics can be obtained. A voice coil of tandem differential configuration is inserted in the annular space of "Dual Halbach Magnet Array" and a spool is so fixed at the end of coil that it may move axially and freely together. When current is supplied in intensified magnetic fields, the voice coil itself generates strong thrust force and moves together with spool in an axial direction. Also, detecting magnets are installed at the other end of spool in such a way that Hall element may detect positional signal and sending coil may directly detect velocity signal of the spool. Therefore, a very stable feedback system can be achived.